Process foods are so lacking in nutrition, and make up so much of the American diet. 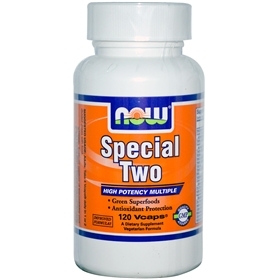 Taking a good quality multi-vitamin & Mineral supplement like NOW Special Two Caps, can really bridge the gap in nutritional deficiencies. Suggested Usage: Adults: take 4 Vcaps® daily in 1 or 2 divided doses, preferably with meals. Other Ingredients: Cellulose (capsule), Magnesium Stearate (vegetable source), Cellulose, Silica, Stearic Acid (vegetable source), Alfalfa Powder and Rose Hips. Contains soy derivatives. Vegetarian Formula. Contains no: sugar, salt, starch, yeast, wheat, milk, egg or preservatives.